Are these the right freewheel/lockring tools? Thread: Are these the right freewheel/lockring tools? I am riding SS on a converted cassette hub. I'm getting a new fixed/free wheel (Surly hub), so now I need to figure out how to install all this stuff on a threaded hub. BMX freewheel remover and a bench vise are needed to remove a freewheel. To install all you need is some anti-seize and two fingers. yes. either of these will work but you do not need a tool to install a freewheel. you only need a tool to remove it. personally, i prefer the hozan head race pliers. they are intended for crappy old french headsets but work great on track lockrings. yup. you could get a dura ace track tool which has a lockring hook and a chainwhip. it's expensive though. cheapest route is probably park hook and cheap-y chainwhip. Install by hand, remove with a tool. 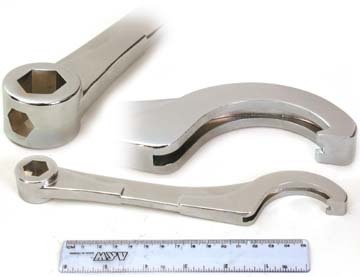 I have an ACS Bear Claw - it removes the BMX style freewheels (both sizes) - it's a huge wrench, it cost $20. Best part is(if you have a bolt-on hub) you can bolt on the wrench so it doesn't slip off and rip open your knuckles while changing cogs. But those are the tools. If you have a rapport with the LBS they'll probably do it free and then you won't need to buy them. Unless you're like me and want to do it all yourself. I think you'll like the Surly, I built up a bolt-on disc SS set and love them! Thanks guys, that is exactly the info I was looking for. I'll definitely invest in some tools, I want to be able to do stuff myself. As it is, I have a pretty well set-up garage shop. That ACS freewheel spanner looks wicked, I'm going to see if I can find it around here. Aaaah... so sweet.Plus I HATE chain whips. But, considering the wrench costs about the same as my entire rear wheel, I need to control myself here.